In this case a “Pattern” is chosen in the Advanced Structure Menu and in the Command screen a “Square” Pattern is chosen. 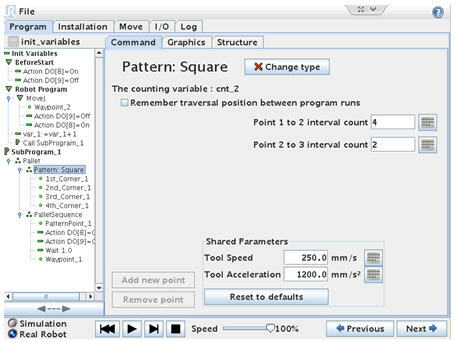 This will create a program entry for a Square (or Rectangular) Pallet Pattern which consists of the 4 corners of the Pattern and a program block for the action at each Point in the Square. The Pattern Square the interval count defines the number of position between the corners. In this case the Square has 8 positions which are arranged 4 by 2. This means the Square (or Rectangular) does not only consists of the 4 corners, but also the intermediate points in the Pattern. And individual Speed for the Pattern can be defined. 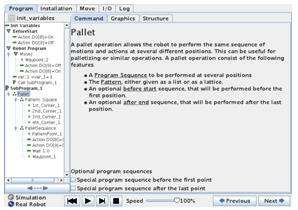 In the “Pallet Sequence” a program can be created which are to be executed every time the robot reaches a point in the Pattern. A PatternPoint_1 is like a Waypoint. 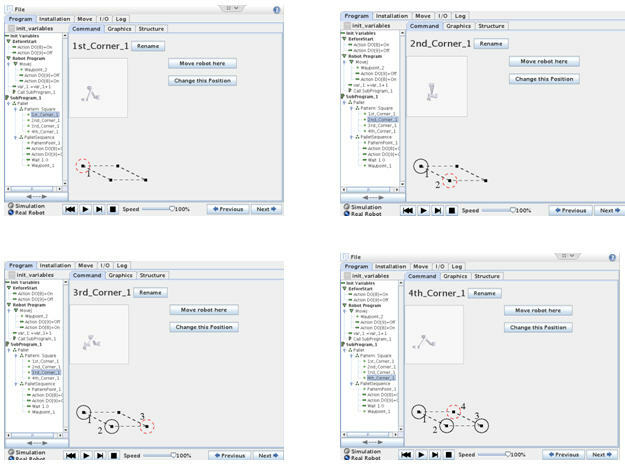 In this example the robot has two waypoints and 2 actions and a wait to perform each time it reaches a one of the 8 positions in the Square Pattern. Problem. The fucntion to create a pallet do not support movement with a changing refenrece, and when i try to implement “MoveL” with the waypoint inside the “MoveL”, the robot always place parts on the 1st emplacement. I am not aware of a function to link the pallet function with a plane feature. These two posts show how it is possible to do math on the plane variable. Are executions of the pallet approach positions relative to a previous move? 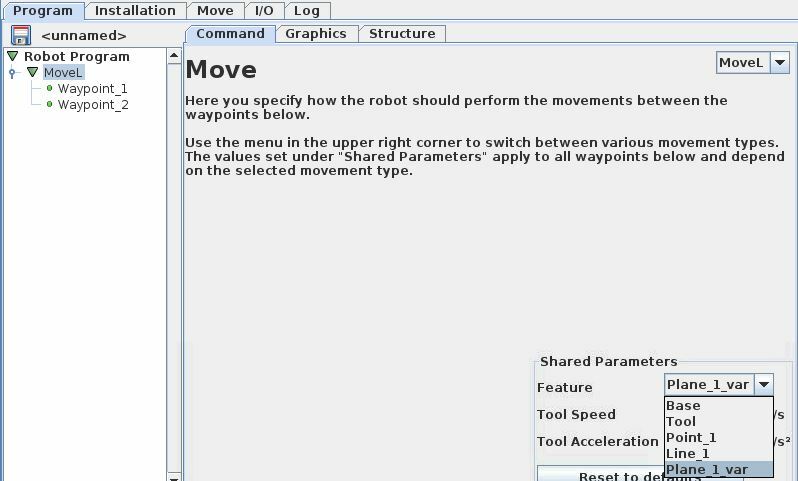 I have found that the robot moves to positions which do not match my programmed approach points if I remove a move command from before the pallet commands in my code. Depending on your program it might be. is there a way to detect a free space in pallet (for example if someone took from pallet) and put into that space? Mayybe a vision camera can be considered. I am having problems trying to get my palletizing program to follow a new plane. I placed it in its own MOVE L, but the program continues to follow the initial positions. At these links there are examples on how planes can be applied. The two posts also show how it is possible to do math on the plane variable. I have a problem with palletizing. From the conveyor come 2 types of boxes, A and B. I want to program the robot to take the boxes and to put them in their corresponding pallet. The boxes come random from conveyor. So, when the robot starts the sequence of palletizing (eg. Pallet A), after a while, come a type B box and the robot must to pause the Pallet A palletizing process and starts Pallet B. The problem is how to make the robot to warning me when the pallet is full. I have tried to introduced a loop sequence, followed by a Popup message. It work whether the sequence of palletizing is continuous, but if the process is paused, for start the second operation of palletization, I received the message from Popup even if the Pallet A is not full. Please help me. I sounds like there is a need for 2 different variables for each type of box. 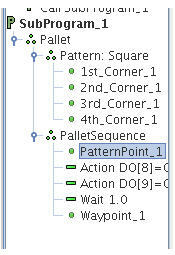 For a new work-piece, I need to change the ‘z’ value of tool position at PatternPoint12b i.e the drop location. We tried to change this waypoint in the teach pendant by moving the robot to this point and using the “change waypoint” option. However, this doesn’t seem to work. Do I have to change the pattern : a1st_Corner_3b…a4th_Corner_3b in order to change PatternPoint12b? That might be a solution – or maybe consider to make a new pallet routine for each different part. I realise now the project that the robot takes 12 parts from conveyor and put them in straight direction on the pallet. After that, robot takes 10 parts from conveyor and puts it’s on the others in a diagonal direction. Next step, I need to repeat first cycle but +120mm higher and so.I know that I need some variable position,but I don’t know how to realise it. But,how I realise the next cycle with z= +120? It is possible to use “Installation variables” which can be created under the Installation tab – and such variable can be stored between program runs. Is it possible to have a drop down list in the operator input instead of just a single input field. We have an application where we move different panels from one stack to a work center and then re-stack them. It is the same basic operation for different sizes of panels. Of course the positions for stacking are different. I would like to use just one program and have the operator choose the panel size from the drop down list so then I would just use different subroutine for the different sizes. I am not aware of any possibilities of a drop down list in an operator input window. Maybe consider to insert text something like “Size 1- Press 1, Size 2 – Press 2, Size 3 – Press 3″ and so on. And then in the program check on 1, 2, 3 …. I am not sure if you mean the script command “freedrive_mode()” or if you mean “Force” mode ? – because I do not find any “Free” function in the Wizard menu. It is possible to put the robot in free drive mode during program execution with the script commands “freedrive_mode()” and “end_freedrive_mode()” to end the free drive. During the time the robot is in free drive mode – the robot release the joints and can be moved arround by hand. (Notice if something heavy is on the robot it might start falling downwards). And this command is not for individual joints, but relases all the joints at the same time. You are correct that it is within the force wizard that the freedrive function was I saw. So there is no way to just release the brake one one joint? So then will need to look for a different solution for what I want to try and accomplish. We have a UR10 that we use as a drill tending robot. We have successfully been using it to destack and stack parts that are 3×5 inch, the incoming and outgoing stacks are 7 rows, 10 columns and 30 layers high. The robot picks the parts, drills them and re-stacks them. We recently trying to add a second drill. However after coping the first program to the second and changing the pallet parameters, we went from 7 to 4 rows, still 10 columns and 25 layers high, the parts are a different thickness, the robot will pick the parts fine, but when going to place them on the outgoing stack the arm seems to go to random spots and crashes into the pallet. We have tried changing the pallet setup to a square instead of a box and we get the same result. We have reset the pallet points several times and readjusted our approach points and the same type of result. Why does the robot not know where to go when re-stacking the outgoing pallet? When we check the 8 pallet points, they seem to be right where we want them. Have you monitored the counters during program run to see if they follow the expected value – and maybe compared to the previous program ? Can you list the two programs before and after change ? Good day, I have a question about paletizing. Is it possible to UR to remember the palet position when I stop robot? For example, when pallet resolution is 4×5 and I stop robot after 3rd piece, I want UR to resume to 4th point of pallet. Is it possible in editor or just write script program? Thanks. Position 4 after position 3 seems normal sequence, but do I understand you correct that in your example maybe after position 3 the robot go out of the pallet sequence for some reason – maybe a change in a condition – and then when you return to the pallet routine then you wish to resume at postion 4 ? If so – a pallet routine has a loop counter which is a variable typical called “cnt_1″ that is increase by one for each run in the pallet routine. It is possible to set this “cnt_1″ variable to a desired value with an assignment. The current value of the variable “cnt_1″ can be seen in the “Variables” tab. There is also the option for “Remember traversal position between program runs” in the Pattern setting and if ticked then the sequence is remember if the program is stopped and restarted. Hello I want to make 2 pallet at the same program, in diferente placement , whith one condition for going to pallet A and other to pallet B, i can go filling both pallets simultaneously, but the problema is to controle the pallet the system créate a counter cont_1 for both pallets and if you fill the first position of pallet A the counter cont_1 is 1, and if the next piece is for the Pallet B now cont_1 is 2 and go to de second position of the pallet B , DON´T FILL the first position if you fill one position in pallet A you cannot fill the pallet B. How i can get 2 diferent counters for each pallet? If understand your question correct then you might need several counters that is counted for each occurrence. You might need an overall counter that counts all the items and count that one up for each move to pallet regardless of A or B (if you need an overall counter). Then you might need a counter for each pallet count_A and count_B and count the one up according to the pallet served. Then you might need a position counter for each pallet position – for example count_A_position and count_B_position and count the one up that is being used. In this way you have 2 different counter for each pallet count_A and count_A_position for pallet A – and then count_B and count_B_position for pallet B. You can create counters by using a variable created with Assignment and then each time the occurrence for an event happens then count one up by for example count_A_position := count_A_position + 1. Hello how is it possible to palleting from a pallet ? :) is it possible to use wizard or do i need to preprograme every move? Yes you can use the Pallet wizard. Then teach the corners and configure how many rows and colloumns you have on the pallet – then the robot will calculate the positions accordingly. I have created a program with palletazing, but when the last layer is finished, the UR starts from beginning again which means he collide. I want the UR to stop after it finished the first pallet and then starts on a new pallet next to it, how do i get this to work? You might consider to create your program with 2 palletizing routines – in a way so when the first palletizing routine is finished then another routine is executed that has waypoints that moves the robot free of the pallet and then move to the second palletizing routines. That was my intention, but when i do so, the UR goes to one position in each pallet in every “loop”. I want it to finish the first pallet before it starts the other, how can i do that? When i do a program with only one palletfunction, the pallet just loops after it done all layers and start over, where to place a “Halt/stop” commando to make it stop after it finished all layers in the pallet/box? Can you show the program ? Y sure, u got a email i can send to? I have the same problem, I create a simple pallet routine but I can´t stopp it after the first squence. Can you write me a small program please? Can you list your program ? There is an application example at this link that uses a pallet routine. You should be able to create new waypoints and then incorporate some logic e.g. counter so each waypoint is associated to the desired row. Is it possible to change the waypoints under pattern command to into variable waypoints? I’m working on two similar pallet routines, but the corner points (a1st_corner, a2nd_corner…) in the two routines are different. What I’m trying to do is have the program ask for a part number at the beginning and call a subprogram that has all variable positions store in it. Then, the robot movement would be based on the defined variable positions from the subroutine. I’m able to do this for normal waypoints, but I couldn’t get it to work for waypoints under pattern command. You should be able to create new waypoints under a pattern which might be variable. Or maybe consider to have two pattern routines – each with different corner waypoints. Is it possible to use a search function inside a pallet function? I need to destack bottles that have different sizes. The thing is when i try it it keeps returning to the first position to search. Are the bottles stacked on top of each other ? – or how can I understand “destack” in your question ? My college just purchased UR5 and I’m currently using UR5 on my project. Project consists of drilling and main problem, so far, is finding the right TCP. What’s the best way to configure TCP? We can’t use default x,y,z parameters because of complicated design of the tool itself and it’s hard to measure it precisely. Also, it’s not in the same axis as the last robot axis. Also, biggest matter of all is trying to drill in the tool axis. How to move UR5 along the axis defined by the TCP of the drill point and the point of the ‘drill start’ hole. Our idea is to define matrix and tipe it in in the ‘Script code’. Is that possible? Any help or link or what ever would be of a great assistance because we’re stuck. Try and look into the Feature function found under Installation tab. With Feature you can define a new reference – Point – Line – and Plane. And then you can select that with the MoveL command – see below image. I had a similar issue while running a destacking program. What I had failed to do was define the tcp of the tool and then call for the tool in those moves as the feature. I have a tool that is at odd angle to the head of the robot and it makes no difference as long as you define it’s position accurately. Thanks for all the help you and your website have provided. I think i figured out the problem, when I was setting the four corners the robot tool head was not level which was causing the pallet function to do its math wrong but it seems to be working good now. Very good and thanks for your feed back. I am currently setting up a UR5 to take parts out of a pallet that is rectangular 15 x 23 and put them into a Lathe and repeat. During the pallet sequence the robot does fine for the first 4 rows but after that it seems to be off track and progressively gets worst as it continues. Do you have any ideas on why it does this and how I can possibly correct this problem? When you set the pallet corners – did you set the “outer corners”. How many rows and columns do you have ? Do the rows and columns physical have the same accurate interval in between them ? Does the robot have a firm mounting ? I need more information’s, but it could be that the waypoints need to be adjusted. Yes I used the outside 4 corners, the pallet is 23 pieces by 15, the interval between each piece is the same and it is exact for each piece, the robot and pallet are fixed to the same base so the orientation can not change between them. I was wondering if when i set the corner points if the robot is not perfectly perpendicular if this could cause the robot calculations to become off set? I think I need to see a video of the situation.